There have been some great times of worship at the Purpose Driven Worship Conference. And in many of those worship times, my mind keeps coming back to the same thought. Several times I have found myself moved to tears as I think about Caleb. And about our unborn child. As I think about Ryan and Noah. As I think about Zach and Zoey. I think about the day that I could see them choose to worship Jesus with this passion and excitement. And then I start praying for them. 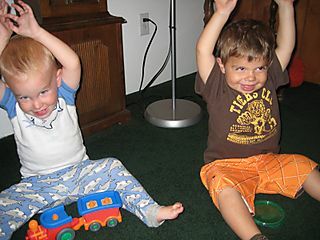 I thought of this picture of Caleb and Ryan with their arms up playing. I look forward to the picture of them older, side by side, with their arms up worshiping their maker together. Jesus, I lift up the next generation of our family to you. Please make them worshipers. Passionate, world changing worshipers. Prepare them to surrender every day of their lives in worship to You. Help us as parents, aunts, and uncles to love them and teach them how to worship. Thank you in advance for the day I get to lead worship alongside Caleb. How awesome Bobby! That was my prayer too when I was your age…now you know how I feel when I see you and Rachel leading worship together. An answered prayer…a feeling like non other. Love you guys! Bobby that was so nice. Thank you for being so thoughtful and thinking of everyone. You are such a great person! !